We are so excited to go on our cruise with Paul Gauguin Cruises! Thanks to all of our wonderful family and friends for everything you have done for us! You all have been such a blessing! Thanks for visiting our retirement celebration registry and our trip website! Together we will experience the exotic luxuries and enchanting island elegance of Paul Gauguin Cruises. 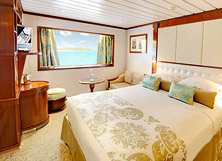 Thanks to your thoughtful contribution we will take delight in the comfort of our stateroom, tantalize our palate with an array of dining options, enjoy an evening of entertainment aboard the ship or experience an array of thrilling and adventurous excursions or a soothing spa treatment. Your generous gift will help our dream cruise become the ultimate getaway! Together, we will indulge in pure romantic bliss while vacationing in paradise! In the tranquil settings of Deep Ocean Spa, we will receive a relaxing massage to calm our minds, followed by a scalp and feet reflexology treat to rejuvenate our bodies. Thanks to you, we will discover the Romantic Experience “Te Here” spa treatment! With your lovely gift, we will discover the awakening of the senses with this Polynesian spa treatment! We will soak in an aromatic bath essence that combines music, colors and the soothing Hei Poa Polynesian scents to leave our skin soft and silky smooth. This lavish spa treat will leave us in a peaceful state of bliss! The Hand and Foot Bliss spa treatment is the perfect gift for our romantic getaway in paradise! First, we will receive a deluxe hand bliss followed by intense hand care, and then we will receive a deluxe foot bliss treat, an intense foot care and a relaxing hot stone foot massage. Thanks to you, our hands and feet will be pampered in the enchanting surroundings of Deep Ocean Spa! Thanks to your wonderful gift, we will take delight in the Marine Body Scrub! Using seaweed or marine crystals, we will receive a gentle cleansing and an exfoliation to remove dead skin cells. Next, we will receive an application of luxurious, hydrating lotion leaving our skin silky smooth and rejuvenated! On our exotic getaway, we will indulge in the Deep Radiance Facial in the serene settings of Deep Ocean Spa! We will receive a lavish mask that will brighten and tone the skin, and improve texture and the natural complexion of the face. Our skin will be glowing radiantly and will be as soft as silk! We will enjoy this deep massage combining several Asiatic techniques that stimulate different points on the body to increase the energy flow. The Oriental Massage will leave our energy levels completely balanced while we are in a tranquil state of bliss. Thanks to your lovely gift, we will discover true romance on our intimate escape! Upon our arrival to our above-water bungalow at the InterContinental Bora Bora Resort and Thalasso Spa, we will be greeted with a welcome drink, a lei and a fruit basket before spending the rest of our day at our own leisure. We can relax on the beach, explore the coastline while kayaking or canoeing or take a refreshing swim in the pool. In the evening, we will share a romantic candlelit dinner, and the morning after we will take delight in a canoe breakfast served to us in our bungalow! On our romantic escape, we will discover the beauty of an underwater paradise with the Stingray Ballet and Snorkel Safari! We will board a covered boat and cruise by the ancient crater rim of Motu Toopua and pass by Motu Tapu where we will come across elegant stingrays. While watching our guide hand feeding them, we will get the opportunity to get close enough to touch them. Next, we will snorkel among an abundance of tropical fish and colorful coral gardens to end our perfect day! 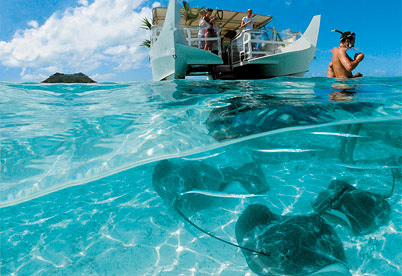 With your thoughtful gift, we will explore Bora Bora’s stunning lagoon with the Aqua Safari Underwater Walk! Our instructor will give us instructions before we put on a special helmet designed to keep our heads dry and descend the ladder into the crystal blue waters. While walking along the bottom of the lagoon, we will come across colorful corals and an array of tropical fish that we can feed by hand. After our underwater walk, we will have time to enjoy snorkeling! Together, we will take part in an exciting off road adventure in Bora Bora on our trip! Aboard a Land Rover, our driver will take us through steep terrain and introduce us to the flora, fauna and lifestyles of this abundant island. We will drive through the small town of Vaitape and drive up Pahonu Hill where we will witness breathtaking views of the harbor and Matira Beach. After that, we will venture to the original location of the cannons from World War II before heading to a plantation in the lush valley of Fa’anui for some great photo opportunities! On our romantic escape, we will explore the lush, exotic beauty of Huahine Nui and Huahine Iti! Aboard an off-road vehicle, we will drive up steep roads for breathtaking views over Huahine Nui’s Maroe Bay and make our way to Faie where we will feed blue-eyed eels that live in the stream running through the village. We will continue on to Maeva and drive along Lak Fauna Nui before visiting Fare where we will have free time to explore on our own and browse the shops. After that, we will cross the bridge to Huahine Iti where we will stop at Parea and Tefarerii to drive through lush plantations before driving to the pier for more photo opportunities! With your wonderful gift, we will take part in the Sacred Sites and Legendary Places of Huahine tour on our tropical getaway! Our guide will take us through a village where we will explore archaeological sites along the lakeshore and the Fare Pote’e Cultural Center. After that, we will make our way to Mata’ire’a Hill to witness marae, agricultural terraces, house foundations, fortification walls and burial platforms before visiting Faie Village to feed blue-eyed eels. This tour will end with a visit to Belvedere Lookout to admire the stunning views of Maroe Bay and Huahine Iti, and a stop in Fare! Together, we will discover Huahine’s underwater paradise with this lagoon cruise and snorkeling adventure! We will take a scenic cruise to Huahine’s sparkling blue lagoon where we will receive a brief instruction before snorkeling in the crystal clear waters. Below the surface, we will explore the colorful corals and come face to face with tropical fish and other types of amazing marine life. Afterwards, we will indulge in coconut served with other fresh fruits and indulgent refreshments! Thanks to your thoughtful gift, we will enjoy horseback riding while exploring Huahine’s exotic surroundings! We will make our way to Little Farm, or La Petite Ferme, where we will saddle up and begin our ride towards Motu Maeva. Here, we will admire magnificent views of the islands, Raiatea, Taha’a and Bora Bora and Huahine’s stunning soft sand beaches! This sunset sail excursion is the perfect gift for our exotic escape! Aboard a 43 foot sailing catamaran, we will set sail to Moorea’s north coast. Here, we will visit Cook’s Bay and Opunohu Bay to discover the views of the lush, tropical beauty. We will sit back, relax and indulge in a cocktail or a glass of wine while admiring the sparkling, abundant waters of the Pacific Ocean! Together, we will enjoy the Moorea Dolphin Watching Expedition on our exotic cruise! Aboard a covered boat, we will cruise to the reef while marine biologist Michael Poole, or his assistant, provides educational commentary on the local, wild dolphins. With a little luck, we will see pods of spinner dolphins, rough-tooth dolphins or pilot whales. We will also learn about French Polynesia’s geology and evolution while admiring Moorea’s lush beauty. Between July and early November, we might also witness humpback whales performing their annual mating and calving rituals. Afterwards, we will enjoy refreshing fruit juices and indulge in local, fresh fruit before swimming or snorkeling in the sparkling waters! Thanks to your thoughtful gift, we will discover everything that Moorea has to offer with this parasailing adventure! We will receive a safety instruction before soaring 200 feet over the sparkling waters while experiencing a thrill and admiring panoramic views of Moorea’s breathtaking surroundings! On our romantic getaway, we will play a round at Moorea Green Pearl Golf Course! This 18-hole golf course was designed to preserve the natural heritage of one of the most beautiful islands while boasting pleasant yet challenging rounds of golf. We will discover lush grassed islands, carefully crafted water hazards, majestic mountain views, magnificent ocean views and sweeping vistas of the surrounding soft sand beach! Thanks to your thoughtful gift, we will discover an underwater paradise in Taha’a! We will board a boat and cruise along the west coast to an uninhabited islet. Our guide will lead us on a walk to the other end of the islet where we will snorkel through the current in the shallow lagoon. 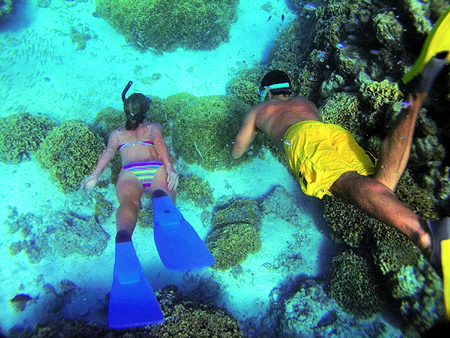 Together, we will experience colorful corals, exotic fish and other amazing marine life. Afterwards, we will indulge in a refreshing beverage on board! Together, we will explore Taha’a and its lush, beautiful surroundings on our romantic escape! Aboard an off-road vehicle, we will drive across the highest mountain in Taha’a where our guide will point out specific highlights and teach us about the traditional uses of local plants and trees. We will sample a variety of fresh island fruits before learning the Tamure, a Tahitian dance, and visiting a small vanilla plantation. Afterwards, we will stop at a black pearl farm to learn how they are cultivated and harvested. Our excursion will end with a sumptuous lunch, activities and snorkeling on a motu. On our tropical getaway, we will take part in the Taha’a Snorkel and Black Pearl Farm Adventure! Aboard an outrigger canoe, we will make our way to Taha’a where we will visit a Poerani, a black pearl farm. Here, we will learn about the black pearls’ cultivation and harvesting process before heading to a small motu where we will snorkel along the drop off of the reef while viewing colorful corals, exotic fish and other types of magnificent marine life! We will board an outrigger canoe for a scenic cruise to Bora Bora Lagoon. Then we will continue onto the Lagoonarium that has an abundance of marine life and a beautiful beach with stunning views of Bora Bora. Here we will relax on the beach or snorkel in the crystal blue waters. We will also have the chance to have up-close encounters with sharks, rays, jack fish, turtles, parrotfish and more. Before heading back, we will enjoy fresh fruit on the beach. Our Window Stateroom boasts a welcoming atmosphere where we can sit back and relax after a day of excitement in the South Pacific, thanks to your contribution! This room offers us a queen size bed with soft linen bedding, a bathroom and a shower with amenities, comfy bathrobes and slippers, a refrigerator stocked with soft drinks, a beautiful view from the window and more. On our romantic escape, we will experience the charming surroundings of paradise! We will indulge in a fine dining experience in the elegant settings of L’Etoile on our romantic escape, thanks to your contribution! Beautifully decorated with classic furnishings and a warm, glowing ambiance inspired by one of the refined dining establishments in Paris, we will tantalize our palates with French cuisine accented by fresh Polynesian flair. Thanks to your thoughtful gift, we will take delight in sumptuous cuisine that is artfully unique and receive impeccable service at L’Etoile! Together, we will discover the indulgence of Le Grill on our romantic getaway in paradise! With your contribution, we will enjoy the charming, casual atmosphere of Le Grill where we will take delight in a buffet breakfast with tantalizing favorites. We can indulge in a poolside lunch with grilled specialties, crisp salads and fresh tropical fruits. During the evening, Le Grill offers us enchanting indoor and outdoor dining for a magnificent dinner experience! On our romantic getaway, we will enjoy an indulgent dining experience in the elegant, charming atmosphere of La Veranda thanks to your lovely contribution! In the settings of La Veranda’s indoor al fresco seating, we will take delight in a delicious breakfast with flavorful favorites or a sumptuous lunch serving fine French cuisine. When evening comes, La Veranda becomes an enchanting French Bistro serving a variety of French cuisines, an extensive wine list and decadent desserts! Thank You for visiting my trip registry and personal website. This trip registry allows me to pre plan all the wonderful things I want to do on my vacation.If you have any questions about how my trip gift registry works, please contact a gift registry specialist at 858-433-1506. Again, Thank You so much for using my trip registry and personal website. Most of all, thank you for helping me have the vacation of my dreams.